Statue of a young Joan of Arc inside the Joan of Arc Center in Domremy. "The Lord is my light and my salvation; whom shall I fear? the Lord is the strength of my life; of whom shall I be afraid? Though a host should encamp against me, my heart shall not fear: though war should rise against me, in this will I be confident." The follwing interesting details about this statue were provided by Virginia Frohlick of the St.Joan of Arc Center and translated into English by Chris Snidow of PilgrimWitnesses.com who also took the photo. 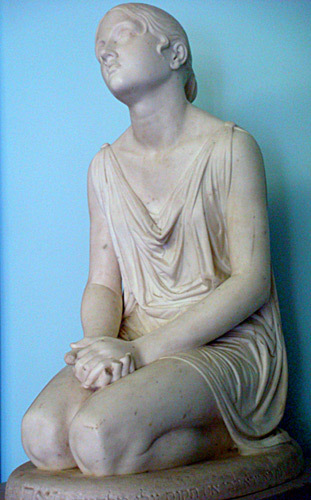 "The Maid up at midnight to listen to her Voices, is the subject of this statue. Marble statue made by an anonymous sculptor, from the last quarter of the 19th century. In August of 1902, an administrative subdivision of Neufchateau received two very large packages (the statue and the stand) from England, sent by a Sir H. Dalton, an Englishman. He had notified them in advance that he was offering this statue to the birth-house of Joan of Arc, and that he was himself coming for its inauguration. The administrative staff of Neufchateau certainly thought it was a beautiful work, and they were also intrigued by the Hebrew text engraved on the stand. They learned that it is verse 1 & 3 of Psalm 27. As the news of this gift got around, it became a big 'story'. The local press immediately flew into a rage, under the pretext that it was "an outrage from a treacherous traitor, and that such the lack modesty excluded it from the sanctuary, etc. So the Neufchateau authorities went again to the Israeli translators to get their opinion. They said that this statue certainly couldn't be any Biblical woman of the Bible, and that it would be contrary to all the Israeli traditions to represent a Jewish woman, head uncovered, and not even with a headband, and praying on her knees. When Mr. Dalton got to Neufchateau, he brought the explanations that they had all been so waiting for. - He had bought it 30 years earlier, found in an artist's workshop, and the artist himself didn't really know from where it had come from. He felt that there was a certain resemblance to the statue by Chapu (1872), that was entitled Joan of Arc at Domremy, it was quite probably him who named it Joan of Arc. - Regarding the Hebrew inscription, he was the one who had engraved it on the stone. He said, " No other language has ever expressed better this religious emotion." - Finally, Sir Dalton stated that although he was Catholic, he believed that all religions, Jewish, Christians and others, could come together in the admiration such a pure figure as Joan of Arc. His comments did indeed calm people down, stopped the spread of rumors, and the journalists went on to the next 'big' story, while the statue went to the Birth house of Joan in Domremy."